Rotating lampshades add visual interest and movement to an otherwise static desk or side table. Some have cutouts that move light and shadow over the walls as the lampshade turns while others have colorful pictures or designs that play across the shade like an old-style movie. You can customize almost any lamp to have a rotating lampshade, though plain shades need sprucing up so the movement doesn’t simply make you dizzy. 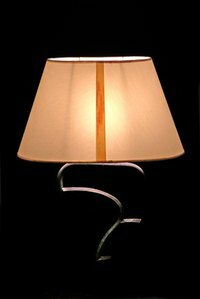 Tape several stencils onto your lampshade, making sure the edges are flush with the surface of the lamp. Dip your stencil brush in a little paint, blot it, and swirl the paint gently over the stencil. Designs include splashing waves, a picture story told by Greek, Egyptian or cave-painting figures and famous faces. Allow your lampshade to dry overnight. Measure across the top opening of the shade and divide the number in half. Stretch your drawing compass open to one inch more than the resulting number. For instance, if your shade opening measures 6 inches across, stretch your compass open 4 inches wide. Draw a circle with your compass in the center of your aluminum pie tin. Cut the resulting circle out with scissors. Poke a small hole in the center of your circle. Use a ruler to draw lines quartering your circle and quartering it again to create 8 wedges. Score along your 8 lines by pushing the tip of your utility knife into the aluminum and dragging it along each line. Start about ½ inch from your center hole and stop about ½ inch from the edge. Push down on the top edge of each wedge, creating tilted, fanlike sails. Snip 3/8 inch long fringe into the edge of your circle spacing each fringe 1/4 inch apart. Bend them down and run a line of glue over the fringes. Slip the aluminum circle into the top opening of your lamp with the fringes pointing down. Press the gluey fringes against the inside of the shade with your fingers, reaching up through from the bottom. Let the glue dry overnight and place the lampshade on your lamp, screwing it down loosely. The heat from the light bulb should make the shade rotate.